Scientists have taken microscopic images revealing that the protein that ties tethering cells together are severed in lung cancer cells - meaning they can break loose and spread, according to research published in Cell Reports. 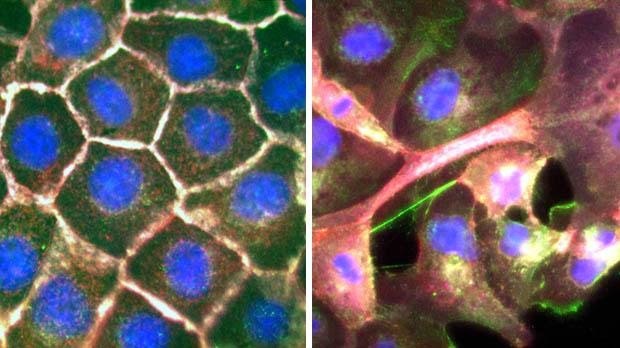 The researchers discovered that the ties which lash cells together - controlled by a protein called TIAM1 - are chopped up when cell maintenance work goes wrong. Healthy cells routinely scrap old cell parts so they can be broken down and used again. But this process spirals out of control in lung cancer cells, which scrap too many TIAM1 ties. Targeting this recycling process could stop lung cancer from spreading by keeping the cells stuck firmly together. There are almost 43,500 new cases of lung cancer in the UK each year. It is the most common cause of cancer deaths and kills more than 35,000 people in the UK each year. Early-stage research like this is essential to find treatments which could one day block cancer spread. It's also crucial to find ways to diagnose the disease earlier, when treatment is more likely to be successful and the cancer is less likely to have spread. Originally from Cancer Research UK.